These sunny fruits are among the most favorite and most healthy foods of modern healthy life-style followers. Health benefits of apricots include numerous therapeutic properties of this natural remedy, such as its ability to treat constipation, various skin problems, strained muscles, earache, indigestion and many more. Apricots are rich in Vitamins A, B2, B3 and C, as well as with useful natural sugars. The fruit is slightly acidic and more likely suitable for blending than for juicing. It is very low caloric and can provide great amounts of healthy nutrition. Somewhere in high mountainous region of Pakistan there’s a large village of about 15,000 dwellers. Ethnographers say that all those hill-folks are very healthy and active, and they live much longer than the majority of modern people from the most developed cities. Certainly, such factors as clean mountain climate plays very important role. However, the ethnographers could learn that 60% of these people’s diet are apricot fruits, fresh and dried, complemented by cereal and vegetables. The scientists are sure that apricots are the main fruits linked to longevity and good health, because apricots contain 10 times more magnesium than other fruits. Besides, apricots can be used to produce apricot kernel oil, one of the basic oil for skin care. There are numerous advantages of eating apricots, both fresh and dried, on a regular basis. Ancient physician and therapist Avicenna wrote about miraculous therapeutic properties of this fruit in his famous The Canon of Medicine. Below, you can read about some of health benefits of apricots. Apricot juice is an excellent source of calcium and iron compounds, that is why it is highly recommended to pregnant women and young children. 150 ml of 100% apricot juice is enough to satisfy our daily need in carotene, and the juice is much easier to digest than apricot fruits. 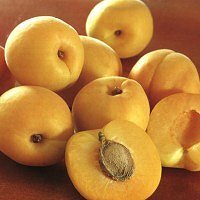 Apricot fruits are very useful to those people, who suffer from anaemia. Only 100 g of fresh apricot fruit has the same effect on blood flow as 250 g of fresh liver. 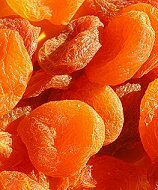 Dried apricots (100-150 g a day) are recommended to all children and aged people as a health-giving natural remedy. Apricots (especially dried apricots) are rich in potassium carbonate, necessary for the people who suffer from various heart related problems, especially arrhythmia and HF. Health benefits of apricot include improved function of brain due to a high content of magnesium and phosphorus. Magnesium can also help to normalize blood pressure very effectively. Positive effects on our eye vision is one more important heath benefit of this fruit. Apricots contain good amounts of Vitamin A and can assist in improving vision. 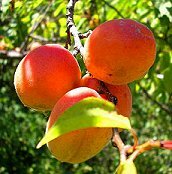 Apricot juice can be used to relief increased acidity in stomach, as well as relieve the symptoms of colitis, flatulence and bacterial imbalances. It is recommended to use a special apricot tea to soothe the pains connected with the problems of digestive system. Finally, apricot is a perfect diuretic and in order to receive maximum effects it is recommended to drink 70-80 g of apricot juice 6-7 times a day.